Last year I wrote a suspense thriller of twenty-six chapters as part of the A to Z blogging challenge. I eventually published this story as an eBook on Amazon Kindle. The novella was titled 'Eighty Hours To Save Karen' and received several rave reviews. Since then I have written another eBook titled 'The Krishnapur Kidnappings' which has also been well received. I thought of writing another thriller for the A to Z Challenge this year too, but after a lot of deliberation, I decided it was high time to embark on writing something based on real life. You see, I really felt my readers might be tiring of reading stories that germinated in my imagination. They say truth is very often more interesting than fiction, don't they? With this in mind, I thought for a brief fifteen minutes and made up my mind on my theme for A to Z 2019. 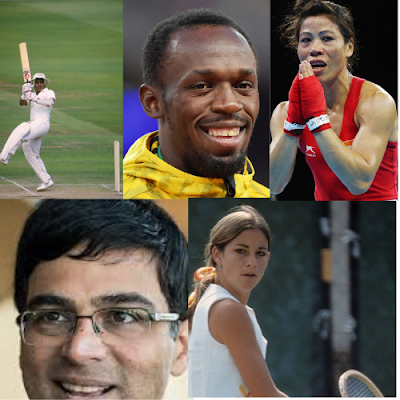 This time, as part of the #AtoZChallenge I will be presenting my readers with the stories of twenty-six sportspersons who have risen to great heights in their respective field of endeavour. Some of these people have made it to to the top from the narrow lanes of small cities, while some come from a privileged background. But they all had one thing in common. The fire in the belly to fight, to struggle and to make it to the pinnacle of glory. The names of these twenty-six people will be related to the twenty-six alphabets of the English language. The relationship between the name and the alphabet could be based on the first name, middle name or the last name of the sportsperson. I will not be restricting myself to any one particular sport. I shall make efforts to bring out the stories of some outstanding achievers from different sporting arias. It could be Chess, Cricket, Football, Kabaddi or any other sport. Hope you find this journey enjoyable, informative, interesting and above all entertaining. I will definitely try to present some inspiring stories, Rashmi. Thank you.